Dinosaurs are some of Queensland Museum South Bank's most popular displays. Three of our most visited dinosaurs are the life-size American dinosaurs Tyrannosaurus rex and Triceratops in ENERGEX Playasaurus Place and Muttaburrasaurus langdoni on Level 2. Dinosaurs belonged to a group of reptiles that included birds, crocodiles and other prehistoric animals such as pterosaurs (flying reptiles). All these animals are called 'archosaurs' or 'ruling reptiles'. Archosaurs first appeared on earth about 250 million years ago. Dinosaurs were animals that lived in the Mesozoic era between 230 and 65 million years ago. All dinosaurs lived on land, had four limbs, walked on two or four legs and breathed air. Some ate plants, others were fearsome carnivores. Like other reptiles, dinosaurs had tough scaly skin, with many dinosaurs having great armour plates and shields to fend off predatory dinosaurs. Some smaller species however, sometimes had a soft feathery down, similar to ducks. 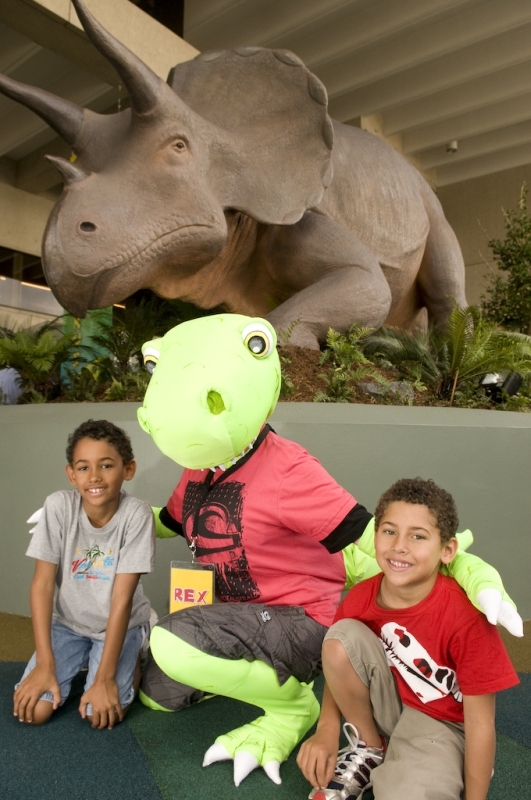 Visit Dinosaurs & ancient life of Queensland to find out more about our home grown dinosaurs. Tyrannosaurus rex in ENERGEX Playasaurus Place. The new model of T rex. Tyrannosaurus rex and Triceratops are popular American dinosaurs, which makes Queensland Museum South Bank a long way from home. Tyrannosaurus rex was one of the biggest land animals ever known. It was up to 13m in length, 5m in height and weighed in at 6 tonnes. T rex was quite slender and agile, and had a mouth filled with dagger-shaped teeth. It ate smaller dinosaurs and other reptiles and used its teeth to tear off chunks of flesh which it swallowed without chewing. T rex lived in North America in the late Cretaceous Period, 68 - 65 million years ago. Queensland Museum South Bank is home to a life-size replica of a Tyrannosaurus rex. But is this how T rex really looked? The replica was made in 1978, but palaeontologists now know that it's not quite correct. Over the last 30 years, palaeontologists have discovered new information about how T rex balanced, how it looked and how it walked. Compare the new model of T rex with our life-sized replica while visiting ENERGEX Playasaurus Place. Triceratops means 'three-horned face', which represents the dinosaur's enormous bony skull with three large horns. Triceratops in ENERGEX Playasaurus Place. Triceratops was up to 9m long, 2.5m high and up to 5 tonnes in weight. Triceratops was a herbivore with a huge appetite and spent most of its day grazing on low-growing vegetation in order to get enough energy for its large body. Triceratops lived in North America in the late Cretaceous Period, 67 - 68 million years ago. The life-size replicas of Tyrannosaurus rex and Triceratops in ENERGEX Playasaurus Place were shipped to Queensland Museum from New York in the late 1970s. They arrived in sections designed to be reassembled by museum staff. Since then they have been much-loved 'guardians' of the museum. Be a palaeontologist and reconstruct a pile of dinosaur bones in the Muttaburrasaurus Game.